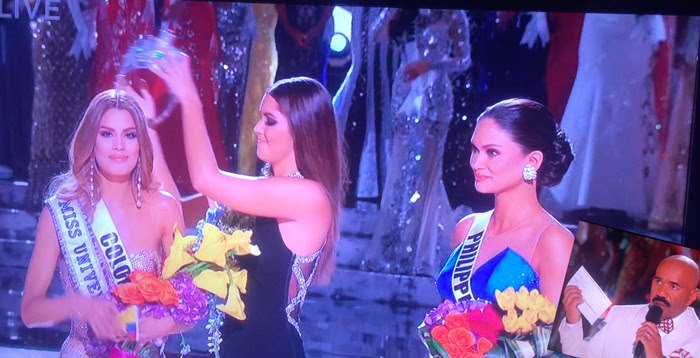 It's safe to say comedian/talk show host Steve Harvey hosted his first and last Miss Universe pageant tonight. The annual beauty contest was held in Las Vegas and after 80 contestants*, the final three left standing were: Miss Colombia Ariadna Guiterrez, Miss Philippines Pia Alonzo Wurtzbach and Miss USA Olivia Jordan. After announcing Miss USA as the second runner-up, Steve announced Miss Colombia as the new Miss Universe, leaving Miss Philippines as first runner-up. But after what seemed like an unusually long time of the newly-crowned winner standing on stage smiling broadly and waving her country's flag, Steve returned to tell viewers he had made a terrible mistake and Miss Philippines (who was the audience favorite) was, in fact, Miss Universe. Miss Colombia was immediately dethroned, Miss Philippines was crowned and she took her first walk at Miss Universe 2015. Awkward. *Actually, the competition began with 81 contestants, but Miss Slovenia suffered a stroke after arriving in Las Vegas leaving her with the right side of her face paralyzed. She was able to walk the stage and have her moment.